This Wednesday evening, the Joffrey Ballet opened the curtain on a magnificent revival of La Bayadère, a classic work that was given new life by Stanton Welch of the Houston Ballet in 2010 before the show was brought to Chicago’s Auditorium Theatre this fall. La Bayadère: The Temple Dancer is a richly romanticized story of love, betrayal, and jealousy, set in an idealized, storybook version of India. It was first performed in 1877 in Russia to the choreography of the great Marius Petipa, famous for his original work in Sleeping Beauty and The Nutcracker and his revival of Swan Lake into the version that still endures today. Welch worked to preserve much of those original movements as well as to update the piece. “[He] has compressed and clarified the story, focusing on physical action rather than traditional pantomime. The story is told through movement with athleticism that appeals to contemporary audiences,” explained Ashley Wheater, the Joffrey Ballet’s artistic director. Indeed, the characters move across the stage in delicate but deliberate steps; the men leap to new, ever more impressive heights, while lithe ballerinas perform ornate but seemingly organic narrative movements of classical ballet, a task quite difficult to accomplish. However, the highlight of the classical technique is in the third act and known as “Kingdom of the Shades.” It is one of the most celebrated scenes in classical ballet. It begins as an ensemble of over 20 women slowly and gracefully fill the stage while performing 38 synchronized arabesques, creating a sea of white tutus and long legs, moving as if connected. The scene, while much less visceral than the rest of the show, which relies on the Romantic style of ballet, requires an incredible amount of precision from all involved; even hands and tutus flutter in sync. The streamlined choreography allows the movements—and the dancers’ training—to speak for themselves. The story line follows the temple dancer, Nikiya, who falls in love with a man, Solor, despite being promised to the gods for a sacramental life. Meanwhile, another man, Brahman, also seeks to marry Nikiya. Then the Rajah requests that Solor marry his daughter, who accepts the offer to wed the princess, knowing he cannot refuse the Rajah. Brahman learns of Nikiya’s forbidden romance and tells the Rajah, not expecting his response: He plans to kill her. From there, the story develops in lavish layers of tragedy and drama that only the 19th century can provide. The story is presented among the opulently decorated, exotic sets and costuming of legendary British show designer Peter Farmer. The stage comes to life with the wildly detailed backdrops and staging, lit up with the colorful attire. Ludwig Minkus’s score, arranged by John Lanchbery, adds yet another layer to the show. Chicago Philharmonic performs it with finesse, swelling just as a dancer leaps or drawing out a haunting violin note as a character slowly leaves another behind. La Bayadère, a difficult but ultimately profoundly moving and stunningly beautiful work, has been breathed back to life with subtlety and flair. It is a triumph for the Joffrey . 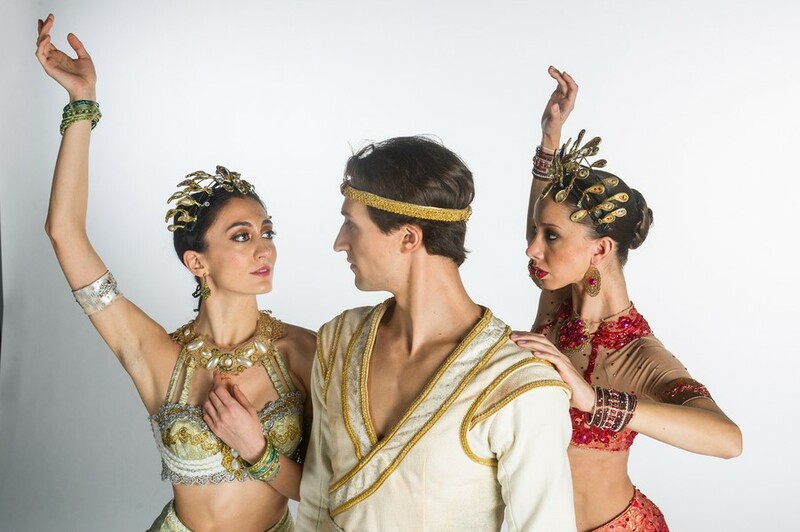 La Bayadère will be at the Auditorium Theatre through October 26.